All activities/camps are open to players from any clubs, and of any ability/experience. 1. Sportways - Wakefield 22-26th July. The Dutchies are back in Wakefield for a fifth time! Experience top level coaching from coaches from the Netherlands as they travel over to Wakefield! All details and sign up via the link below. Travel over with Danny Berry (Wakefield HC junior coach) to Amsterdam to experience Dutch Hockey at its best. Experience top Dutch hockey, meet kids and staff from all over the world and see top European Senior Hockey and be coached by top international players! Information and sign up via the link below. 3. Green Army Hockey Camps 9-12th April, 28-31st May, 27-30th August. 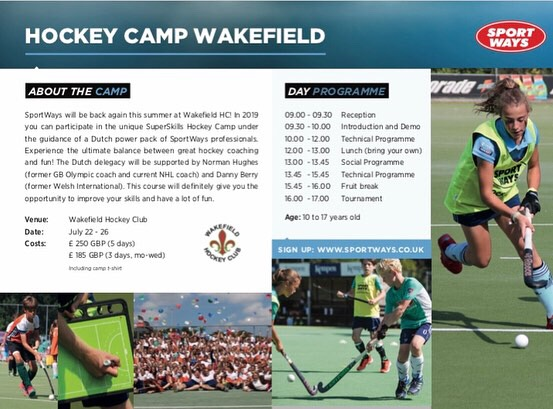 Fun and exciting hockey camps ran by Danny Berry (former international player and coach) at Wakefield Hockey Club. This is our 6th year and we’re running more camps with higher numbers of kids than ever before! All details and sign up via the link below.  Do you wish to coach a winning team? Then please step forward and support our club. Thirsk U14 Girls off to Nationals!  A long journey does not reduce the abilities of this team.